(Bloomberg) -- As far as rallies go, this one has been notable for its speed and its strength, and not much else. If you’re looking for other things in stocks to shore up confidence, you probably won’t find them. And that’s just fine, says a growing contingent of bulls. Sure, the 23 percent rally since Christmas ranks with the fastest gains ever recorded, but it’s happening with almost no help from some of the biggest industries in the economy -- finance and energy. Market barometers like small caps and transports aren’t participating. Professional investors won’t touch stocks with a pole, worried earnings are about to collapse. Rather than signs of weakness, the market’s deficiencies are starting to look like strengths to a few money managers. They’re temporary annoyances, these investors say, and when cured will lure a steady stream of buyers. The S&P 500 is up 10 of the past 11 days, inching closer and closer to uncharted ground. Now only 1.5 percent away from September’s record, voices of caution are growing louder, music to contrarian ears. Take the following pessimistic claim. Since the drama in stocks began on Sept. 20, only a third of the S&P 500’s industries have reclaimed new highs. The leaders? Defensive areas like household and personal products, consumer services, real estate and utilities. Many have framed those contours as evidence animal spirits remain muzzled. Worse: Energy and bank companies, two of the S&P’s top 10 industry weights, are still roughly 10 percent below their late September levels. The Russell 2000 Index of small cap stocks and the Dow Jones Transportation Average are far off, too. But how formidable an obstacle is it when giant groups like these lag behind? The past suggests, not very. 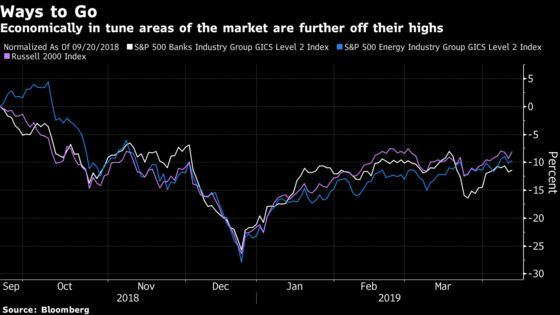 When the S&P 500 finally breached new highs last year after the February rout, five of the benchmark’s top-weighted industries hadn’t participated, including energy and banks. There’s reason to think those industries could play catch up, juicing this years gains more. With oil prices up more than 40 percent this year, JPMorgan Chase & Co. says energy stocks are due for an outsize rally. And with banks set to see earnings stronger than those of the broader market when JPMorgan and Wells Fargo & Co. kick off the reporting season Friday, they could see some upside too. “The way banks are trading, even with the dynamic of the yield curve, people are probably underestimating what this earnings season could be for financials relative to the rest of this market,” said Yousef Abbasi, director of U.S. institutional equities and global market strategist at INTL FCStone. Then there’s the fact that this year’s rally has been an unloved one. Hedge funds have sat out, and while retail traders say in surveys that now is a good time to invest, indeed they’re nowhere to be found. In the week ended April 3, investors pulled the most money out of mutual funds this year, data from the Investment Company Institute show. Better for the bulls -- it’s just more dry powder itching to be put to work once a high is breached. Analysts lowered their earnings forecasts for the quarter at the fastest pace in three years? Oh, that’s actually good too. 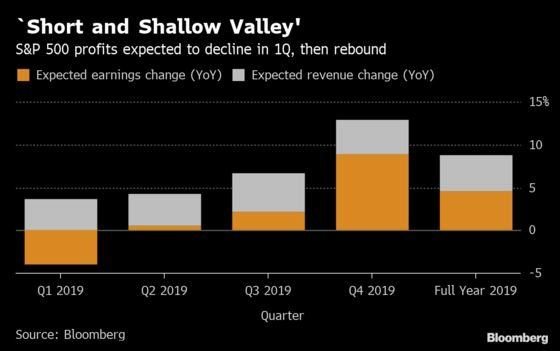 Back in January, only 32 percent of earnings-per-share revisions were to the upside, a level that tends to mark a bottoming out of profit cuts when a recession is not in the offing, according to RBC Capital Markets. 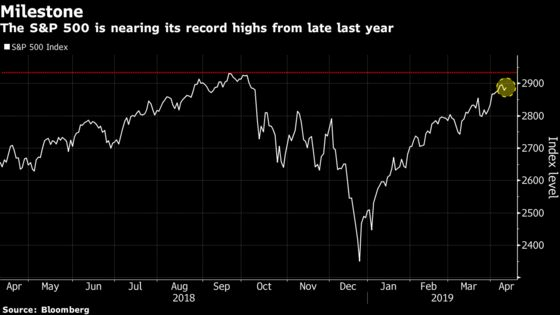 In the past when the share has fallen that low, the S&P 500 has risen in the next year three-quarters of the time, with gains averaging near 10 percent, RBC found. With profits for S&P 500 companies expected to fall 4 percent in the three months ended in March, the first contraction since 2016, the bar is low. Maybe just low enough that when companies likely beat, their shares will soar. During the last earnings season, investors rewarded reports that were better than expected more than they punished those that missed. This time around, that pattern will likely repeat, according to Bloomberg Intelligence.